Joseph Riloquio is an Administrative and Humane Education Assistant with Valley Animal Center in Fresno, California. VAC shares their animal rescue adventures with us every month. Check out KRL’s interview with VAC to learn more about what they do. Jared is a ten-week-old orange tabby male domestic short hair kitten. Jared was brought to Valley Animal Center with his brother Eric after experiencing severe trauma. Both Jared and his brother were tossed out of a moving vehicle by someone who no longer wanted them. Luckily, a Good Samaritan saw the incident, and took the kittens to Fresno Humane Animal Services who then contacted us. Our team at Valley Animal Center sprung into action! We quickly discovered that Jared was severely injured, suffering from multiple broken bones; including severely fractured legs. 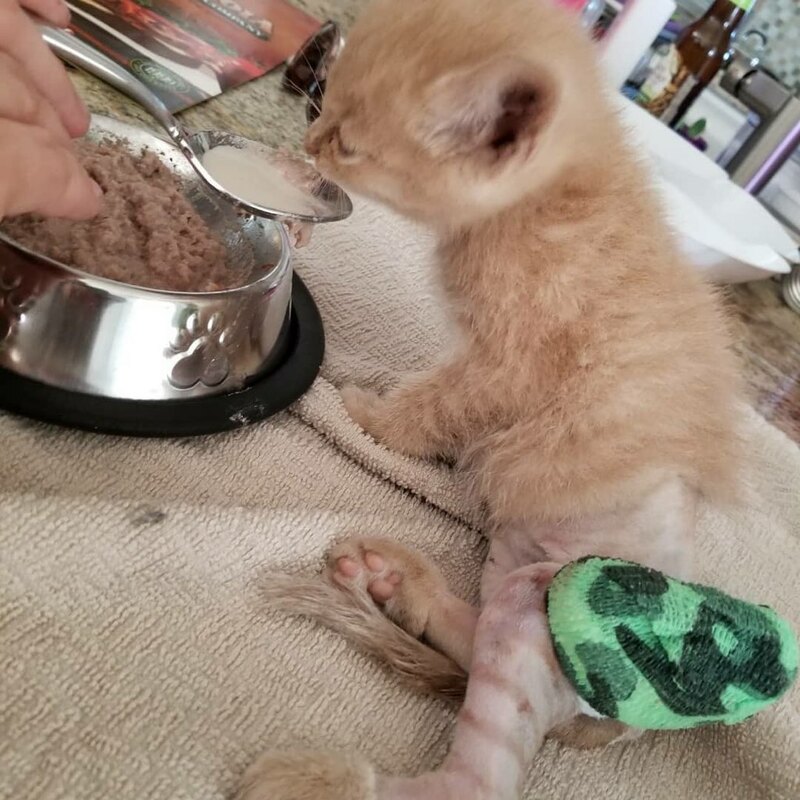 Our foster leader sprung into action, took the kittens in, and raised the funds to get Jared his much needed surgery on his broken legs. Dr. Gaheer at Kingsburg Veterinary Clinic agreed to take on the unique case, and performed Jared’s surgery. After a successful surgery which included multiple pins in his leg, Jared went home with our foster leader to begin his road to recovery. In the little over a month since his surgery, Jared is doing better than we could have hoped for! He is extremely playful, curious, and loves all the attention he gets in his foster home. His legs are healing extremely well, and he recently had a new space bar put in to allow for more bone growth. His doctor believes he will grow into a healthy adult cat with no lasting effects from his injuries. Jared and Eric may have had a rough start, but they are very excited to find their forever homes! 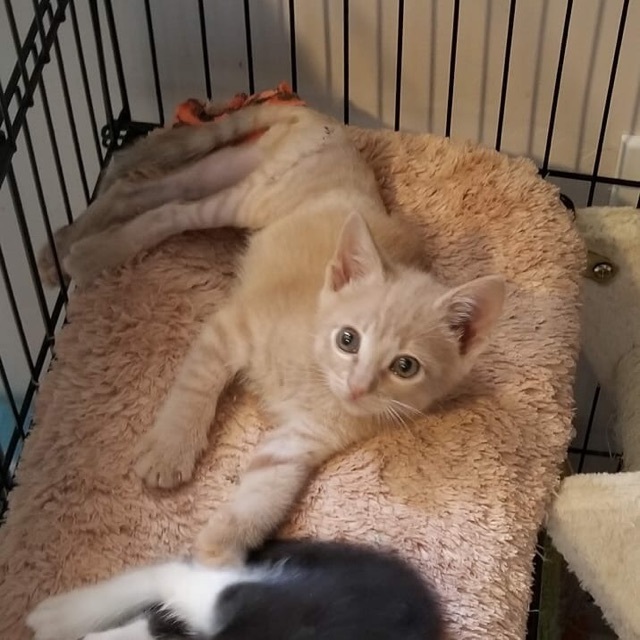 Eric was just placed on the adoption floor, but Jared still needs a few more weeks to rest and heal before he is ready to be adopted. Valley Animal Center has taken in over 150 foster kittens in 2018 so far! We rely heavily on community support and welcome any and all donations so we can continue rescuing animals like Jared. If you are interested in adopting any animal from the Valley Animal Center, please visit our website at www.valleyanimal.org to view the requirements. You can also call or visit our adoption centers seven days a week from 10 a.m.-4:30 p.m. All of our animals have been spayed/neutered, are up to date on their vaccinations, are dewormed/deflead, and are micro-chipped as well! For more information about Valley Animal center you can visit www.facebook.com/ValleyAnimalCenter and their website. Check out more animal rescue stories in our Pet Perspective section & watch for more stories from Feral Paws every other month, and we would love to have you join our KRL Pets Facebook group. Advertise in KRL and 10% of your advertising fees can go to Valley Animal Center.